Hostal Almanzor i Córdoba, Spanien: Reservér nu! We are a Hostel of recognized prestige in our sector. We offer services at very competitive prices and the highest quality backed by facilities; Quiet, comfortable and comfortable that are characterized by their cordial treatment and helpful spirit. We will be happy to show you all the possibilities and options at your disposal, we are convinced that you will find what you are looking for. 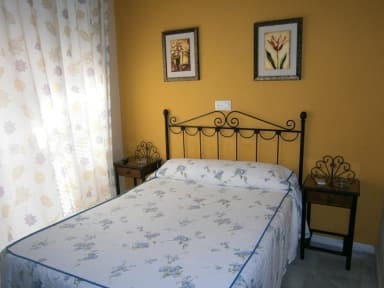 The main objective of our guest house is undoubtedly to satisfy all the needs of our guests. Hostal Almanzor offers air-conditioned rooms with a balcony, cable TV and a private bathroom. Family rooms are also available. The rooms have balconies overlooking the ancient streets of the Jewish quarter. In addition, the establishment harmonizes perfectly with the historical environment, dating from 1860 and presents a characteristic style of the region. This charming establishment, located within walking distance of the historical monuments of Cordoba, is typically Andalusian accommodation. Hostal Almanzor has private parking and Wi-Fi. The Almanzor is the ideal starting point for exploring the sights of Cordoba, such as the famous mosque and the surrounding streets, which can be easily reached on foot from the establishment. Payment on arrival in cash, credit cards, debit cards. This property can pre-authorize your credit card prior to arrival.